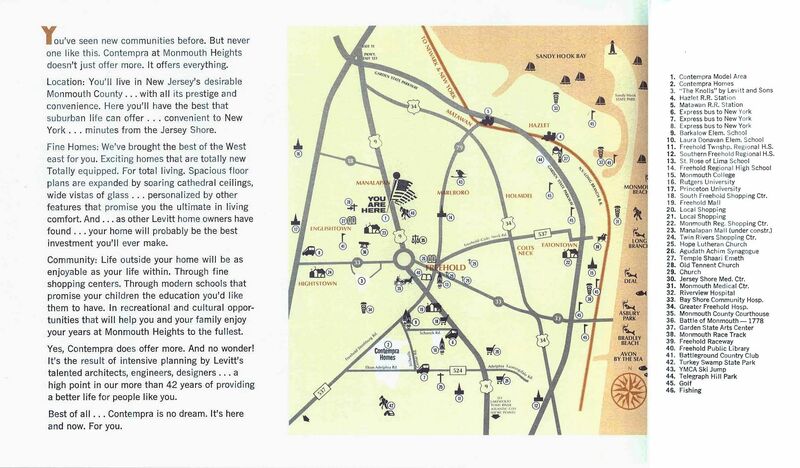 Winslow Crossing was Levitt's next "new frontier" following Levittown, N.J.
Set with an Old West theme symbolizing broken ground in new territory, Winslow Crossing incorporated "new" West elements in its contemporary houslines fresh from California. 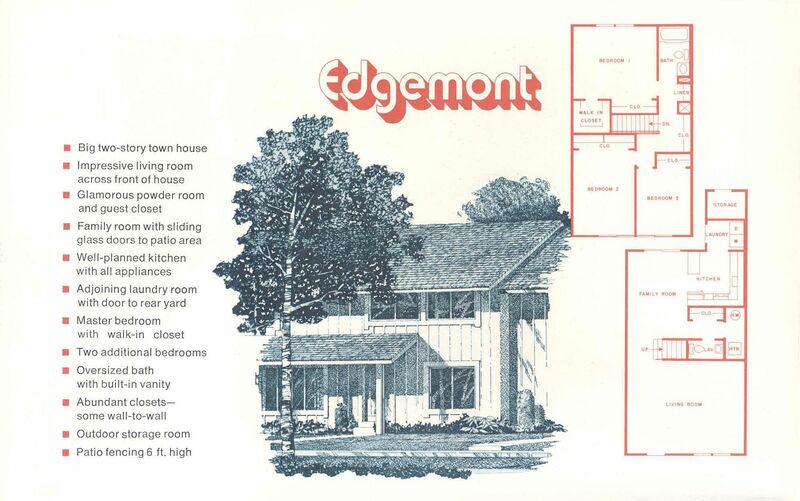 Within two years of its opening, however, Winslow Crossing's contemporary houselines would be replaced with traditional styles, with many models retaining the floor plans of their contemporary predecessors. 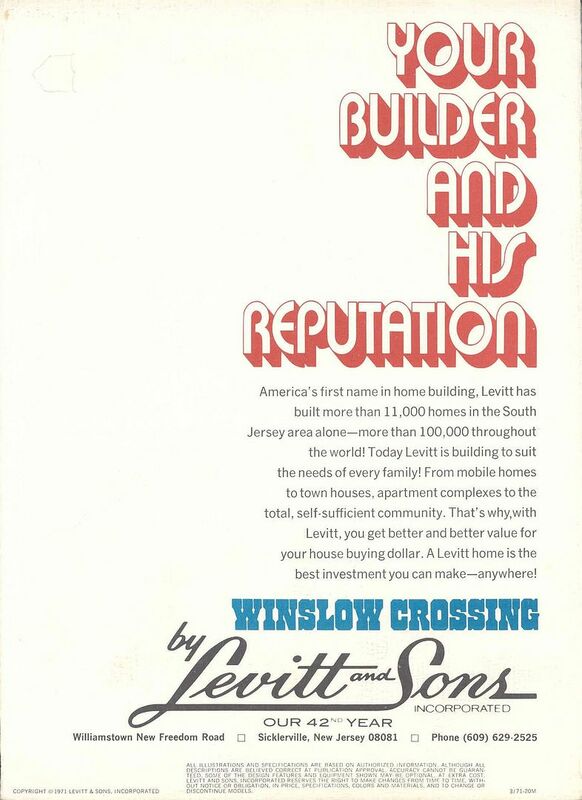 The East Coast may not have been ready for contemporary designs, and Levitt was probably ahead of his time with the new, bold designs. And Winslow Crossing was a new frontier. 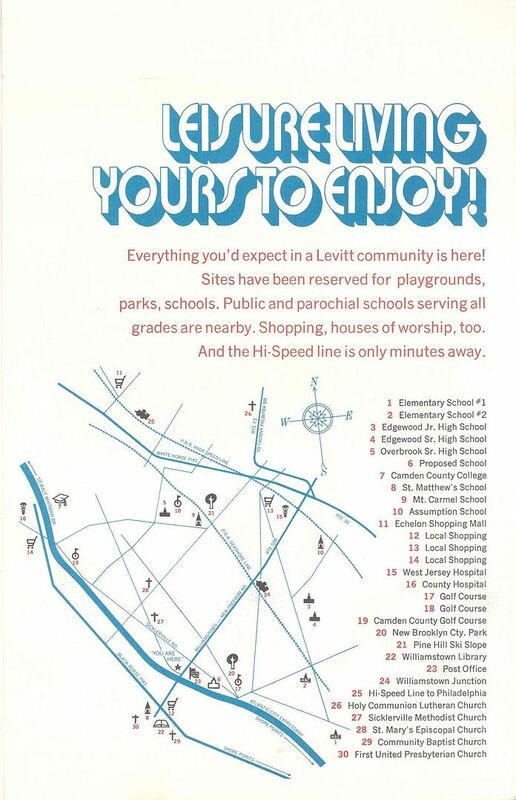 Located on the suburban fringe of the Philadelphia-Camden area, Levitt sought to create new town, a self-contained planned community. S I C K L E R V I L L E , N . J . 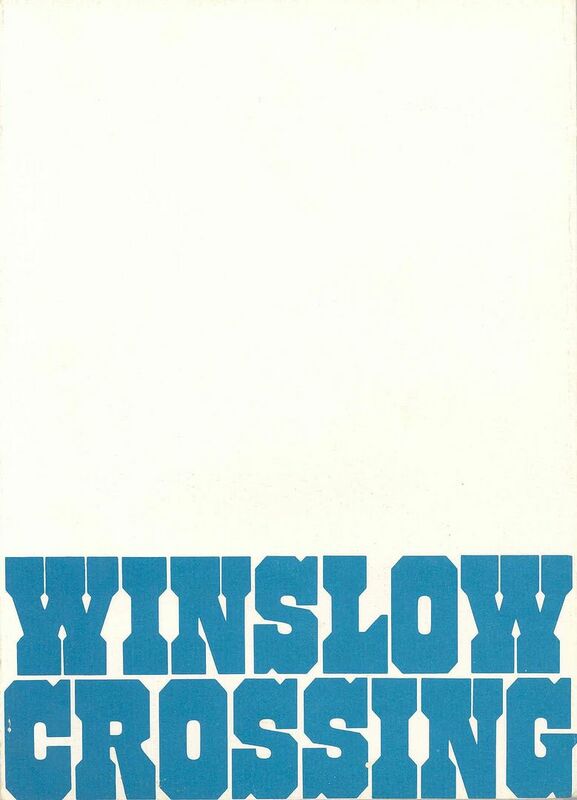 Location: Sicklerville, Township of Winslow in Gloucester County, N.J. 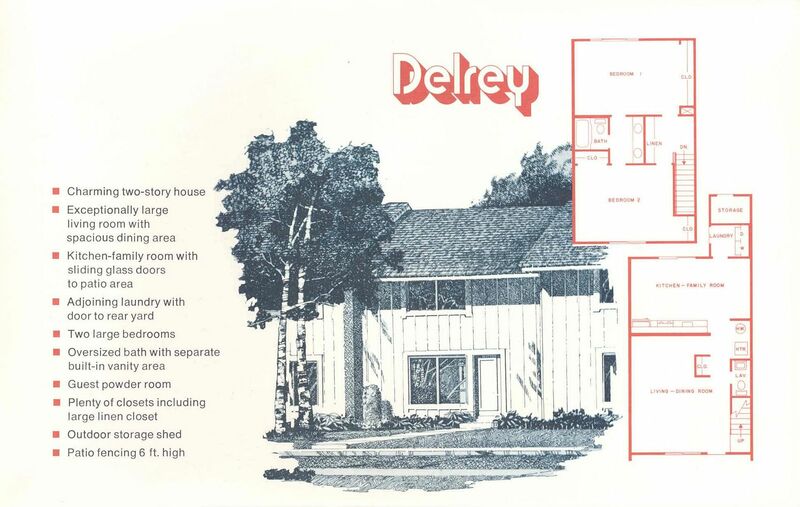 Constructed by Levitt and Sons, Inc. (Delaware), Levitt Residential Communities, Inc., Levitt Homes, Inc.
Open for sales April 4, 1971. Winslow Crossing Exhibit Center and sample homes located on Williamstown Road off the Atlantic City Expressway. The site is now NJ Transit's Avandale Park-Ride facility. Official web site for the Township of Winslow. 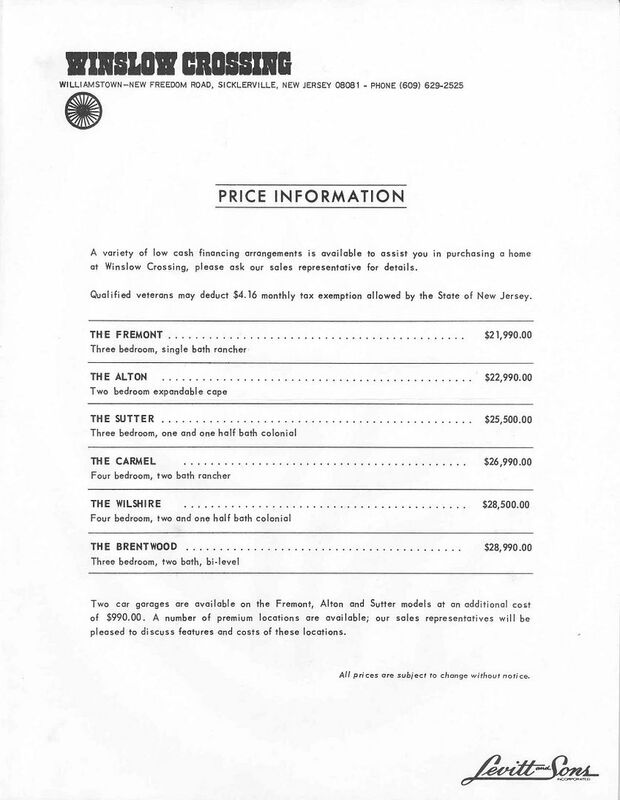 View the Front Cover and Back Cover of the original foldout brochure and a few words from your builder, Levitt and Sons, Inc.
View the Price List for the homes. 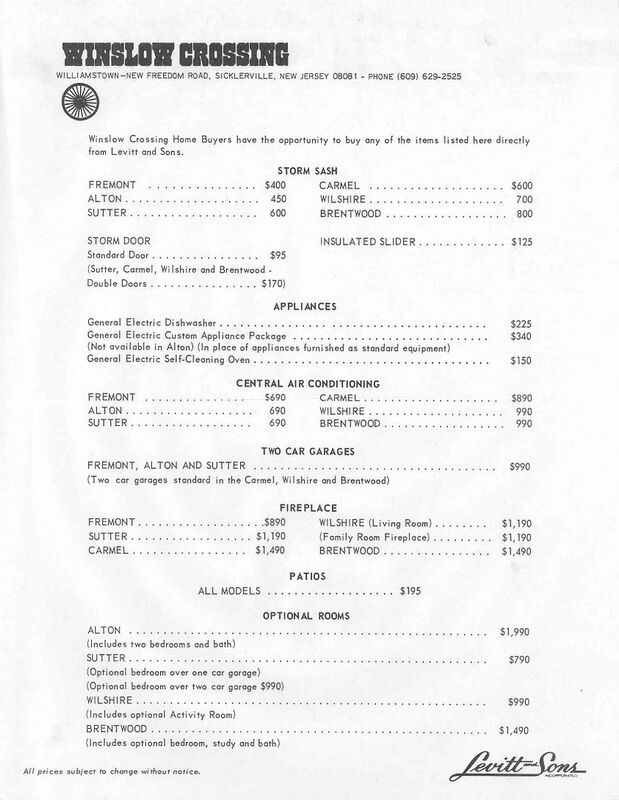 Two-car garage is available on select models. View the Options List for such items as storm windows and doors, upgraded appliances, central air-conditioning, two-car garage, fireplace, and patios. Many models even offer the flexibilty of additional rooms and baths to meet the needs of any size family. "New Frontiers in Better Living"
View the Community Profile and read about the new homes and lifestyle at Winslow Crossing--Levitt's new town on a new frontier. View the Location Map and see the location of new planned community of Winslow Crossing--close to the famed Jersey Shore, even closer to Center City Philadelphia! Winslow Crossing has direct access to the Atlantic City Expressway and the Hi-Speed rail line to Phialdelphia from Lindenwold Station. Tour all six sample homes and select the style of your new home at Winslow Crossing. All homes are California contemporary in style, with dramatic interior spaces. 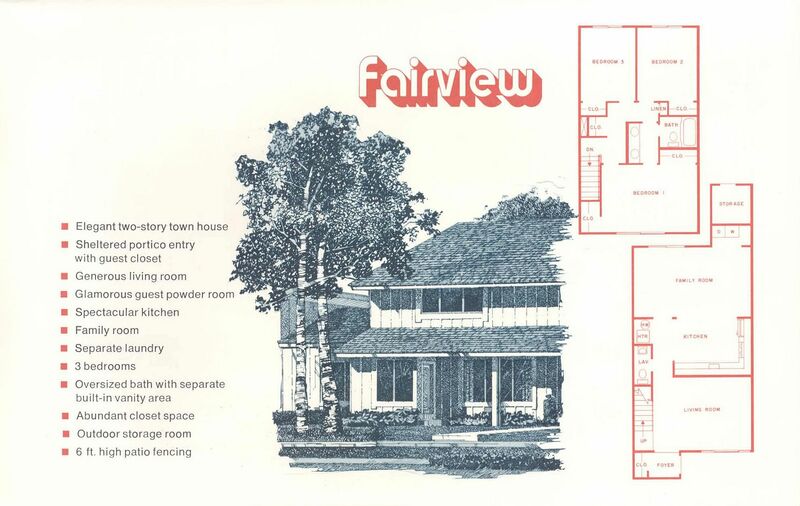 Discover new frontiers in better living in these new homes designed for the lifestyle of the '70s. First residents will select homesites in Primrose Gate, Winslow Crossing's first of many planned neighborhoods. 1-1/2 Story (Cape Cod). 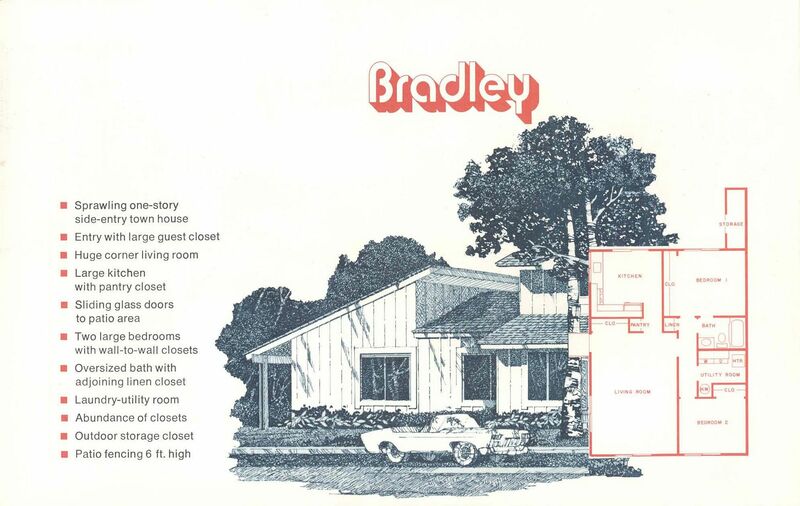 2 Bedrooms, 1 Bath, Entry Foyer with Guest Closet, Front-to-rear Living Room with Cathedral Ceiling, Sliders to back lawn, and Floating Staircase to Balcony and unfinished Dormered Upper Level, Optional Finished Upper Level with 2 additional Bedrooms, 1 Bath, Storage Closet, and Walk-in Closet in Bedroom 3, One-car Garage with Utility Area, Optional Two-car Garage with Stoarage Area. Bi-Level. 3 Bedrooms, 2 Baths, Entry Foyer, Living Room with Cathedral Ceiling, Adjoining Dining Room with Sliders to Optional Deck, Kitchen-Family Room with Pantry and Sliders to Optional Deck, Master Bedroom with Separate Vanity and Bath areas and Walk-in Closet, Lower-level Recreation Room with Laundry-Utility Room, Sliders to back lawn, and Optional Fireplace, Optional finished area with Study, Bedroom 4 with Walk-in Closet, and Bath, Two-car Garage with Storage Area. Rancher. 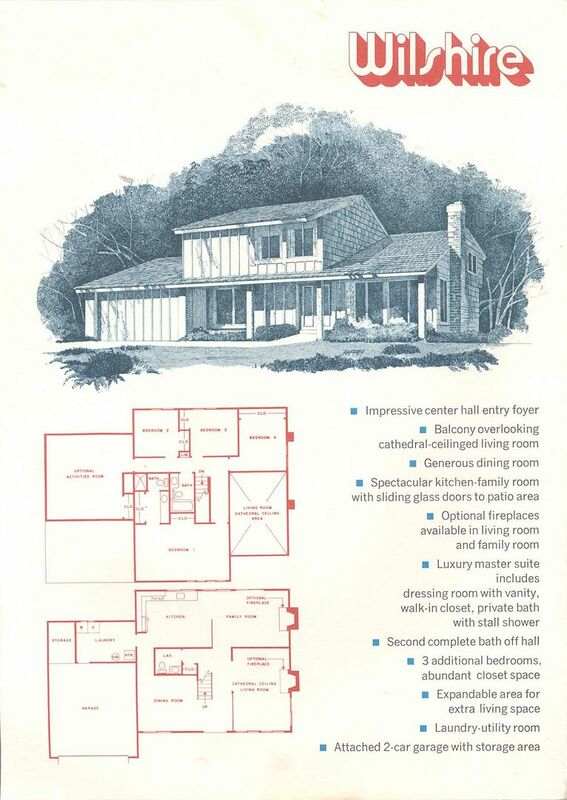 4 Bedrooms, 2 Baths, Entry with Beamed Trellis, Entry Foyer, Living-Dining Room with Cathedral Ceiling and Optional 2-way Fireplace open to Family Room, Familiy Room with Cathedral Ceiling and Sliders to back lawn, Eat-in Kitchen, Master Bedroom with Separate Vanity and Bath Areas and Walk-in Closet, Bedroom 4 as Optional Study open to Foyer, Laundry-Utility Room with Garage access, Two-car Garage with Storage Areas. Rancher. 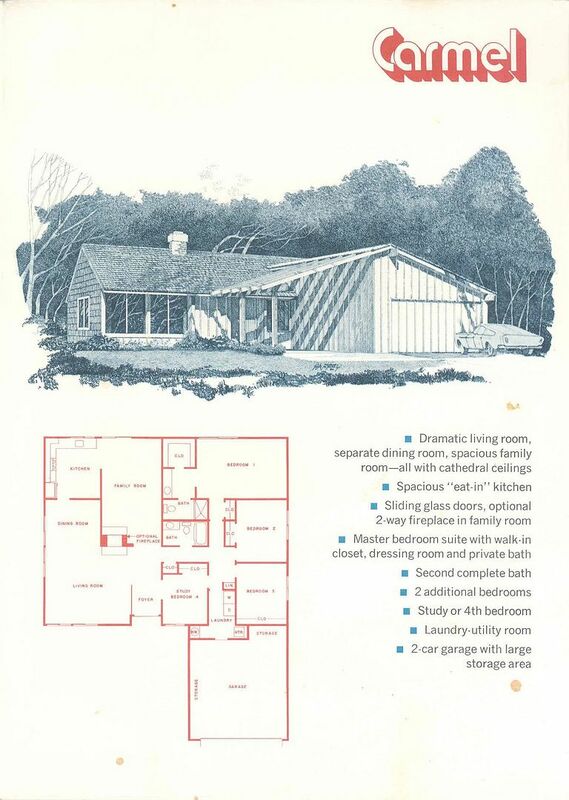 3 Bedrooms, 1 Bath, Covered Entry with Beamed Trellis, Entry Foyer, Laundry-Utility Room with Garage access, Rear-facing Living Room with Cathedral Ceiling and Optional Fireplace, Kitchen-Breakfast Alcove with Sliders to side lawn, Master Bedroom with Oversized Closet and acess to Bath, Overssized One-car Garage with Storage Area, Optional Two-car Garage. 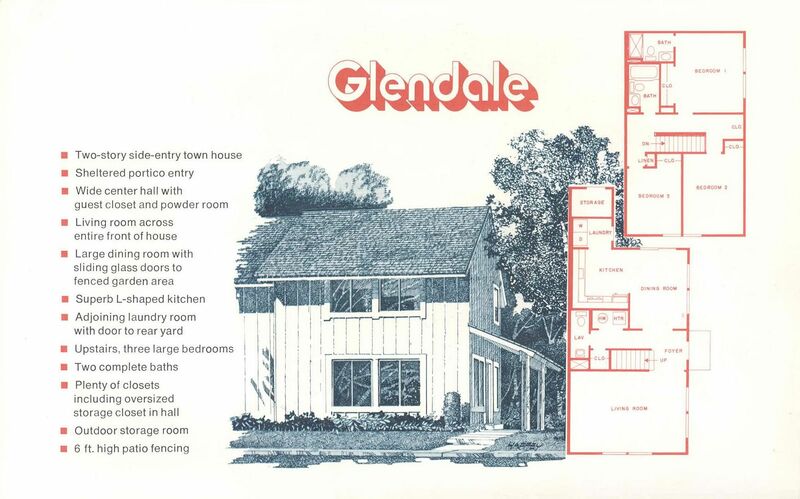 2-Story plan. 3 Bedrooms, 1-1/2 Baths, Covered Entry, Raised Entry Foyer, Living Room with Cathedral Ceiling, Adjoining Dining Room, Rear Family Room with Sliders to back lawn, Adjoining Eat-in Kitchen, Laundry-Utility Room with Garage access, Balcony overlooking Living Room, Master Bedroom with Walk-in Closet and access to Bath, Bath with separate Vanity area, Optional Bedroom 4, Oversized One-car Garage with Storage Area, Optional Two-car Garage. 2-Story Center-hall plan. 4 Bedrooms, 2-1/2 Baths, Covered Entry, Entry Foyer with Floating Staircase, Living Room with Cathedral Ceiling and Optional Fireplace, Formal Dining Room, Rear Family Room with Sliders to back lawn and Optional Fireplace, Adjoining Eat-in Kitchen, Laundry-Utility Room with Garage access, Balcony overlooking Living Room, Master Bedroom with Separate Vanity and Bath areas, Optional Activities Room, Two-car Garage with Storage Area. Tour all five sample homes and select the style of your new home at Winslow Crossing. All homes are California contemporary in style, with dramatic interior spaces. 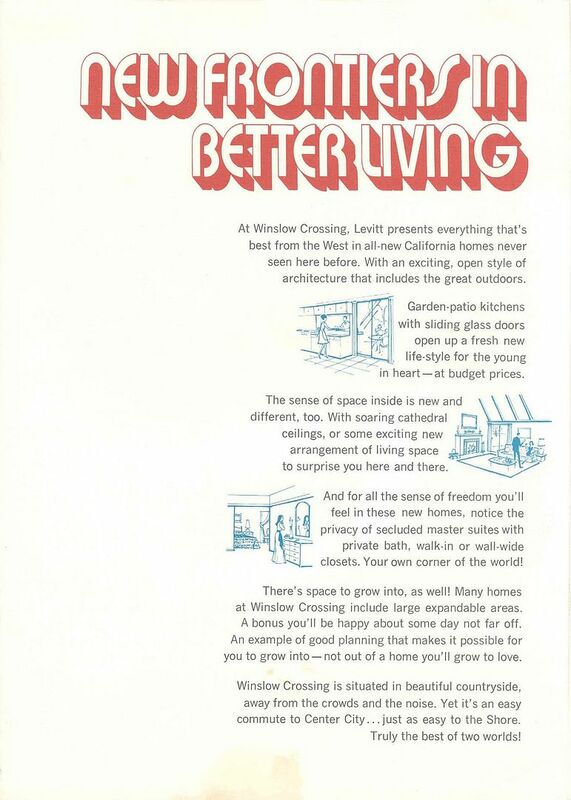 Discover new frontiers in better living in these new homes designed for the lifestyle of the '70s. First residents will select homesites in Manor Hall, one of Winslow Crossing's many planned neighborhoods. Rancher. 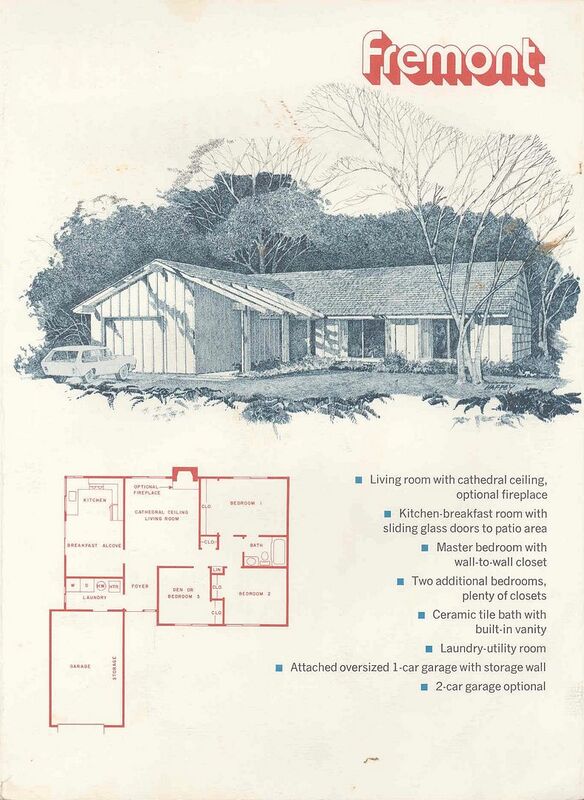 2 Bedrooms, 1 Bath, Covered side entry, Living Room with with Guest Closet, Eat-in Kitchen with Pantry and Sliders to back Garden, Laundry-Utility Room, Storage area with exterior access, Private back Garden with 6-foot High-board Screen. 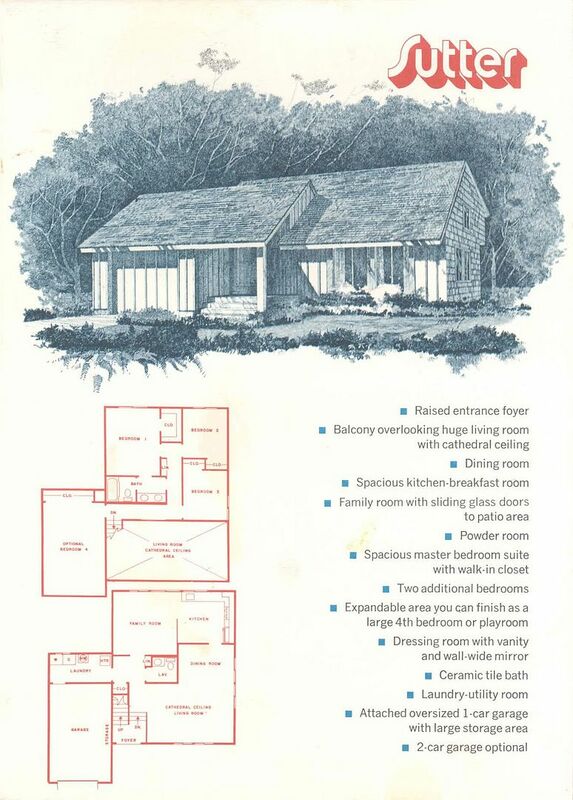 Two-story plan. 3 Bedrooms, 2 Baths, Covered Entry, Living-Dining Room, Kitchen-Family Room with Sliders to back Garden, Laundry Room with door to rear Garden, Separate Bath and Vanity areas accessible from either bedroom, Storage area with exterior access, Private back Garden with 6-foot High-board Screen. 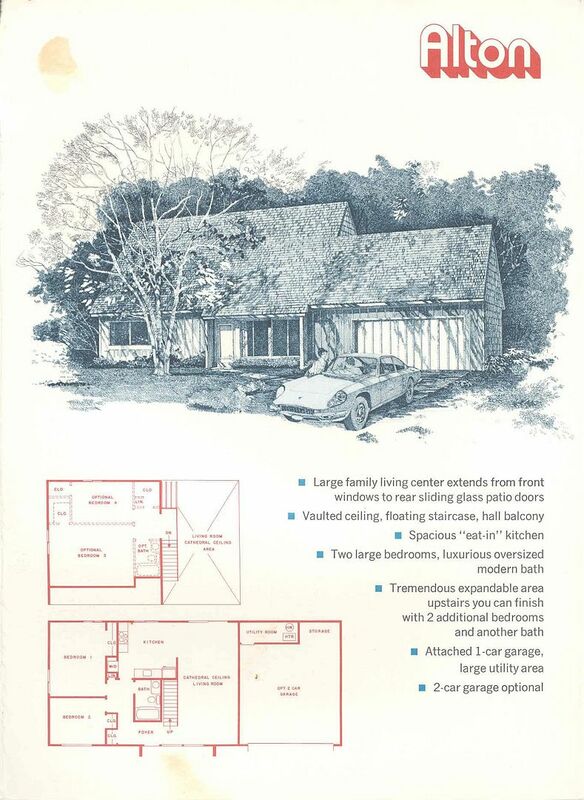 Two-story plan. 3 Bedrooms, 1-1/2 Baths, Center Stairway, Family Room with Sliders to back Garden, Kitchen with Serving Counter to Family Room and Laundry Room with Garden access, Master Bedroom with Walk-in Closet, Storage area with exterior access, Private back Garden with 6-foot High-board Screen. 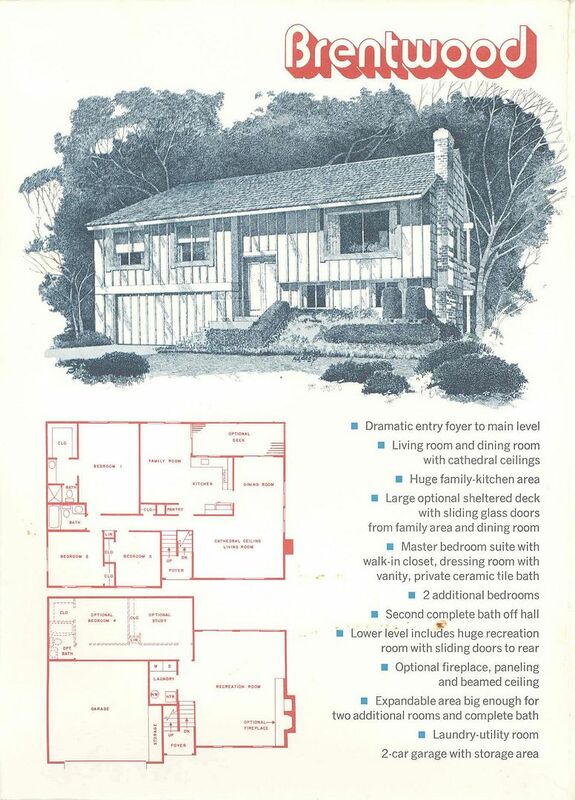 Two-story plan. 3 Bedrooms, 1-1/2 Baths, Covered Entry, Entry Foyer with Guest Closet, Eat-in Kitchen open to Family Room, Family Room with Laundry Area and Sliders to back Garden, Separate Bath and Vanity areas accessible from Upper Hall or Master Bedroom, Storage area with exterior access, Private back Garden with 6-foot High-board Screen. Center-hall Colonial End Unit. 3 Bedrooms, 2-1/2 Baths, Covered Side Entry, Entry Foyer, Living Room with Optional Fireplace, Formal Dining Room with Sliders to back Garden, Kitchen with Laundry Area and Garden access, Storage area with exterior access, Private back Garden with 6-foot High-board Screen.